I’ve grown a lot of different vegetables at this point, but there’s always something new for me to try. 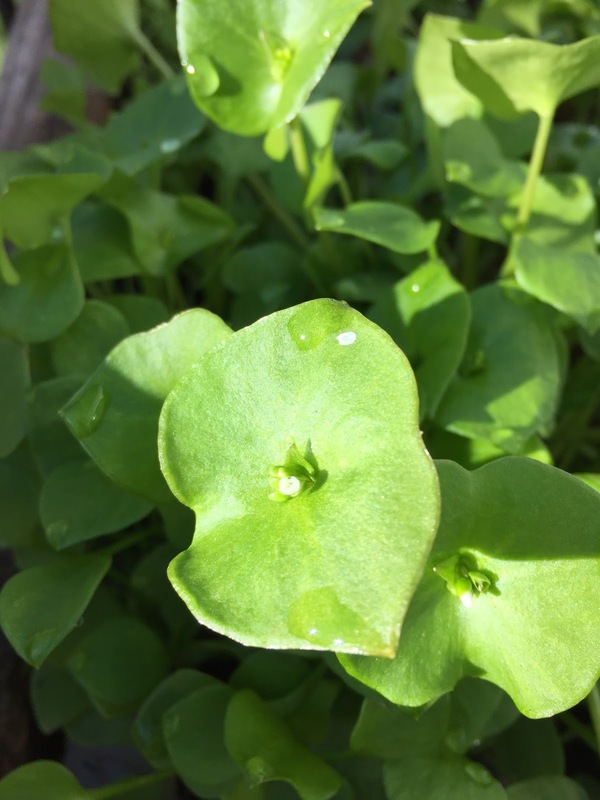 Last fall I planted some Claytonia perfoliata, or miner’s lettuce, alongside spinach in my vegetable garden. Both of them have wintered over nicely and are being harvested now. Claytonia is a odd-looking small edible green plant. That specific epithet “perfoliata” refers to the way the leaf is pierced by the flower structure. Each of those leaves is about the size of a quarter, so you need a lot of them to make a meal, but you wouldn’t want to overdo it anyway because they contain oxalic acid which is toxic in large quantities. (More than you would want to consume; don’t worry.) You can use claytonia in a salad, or briefly braise or wilt it in a cooked dish. It has a nice lettuce-like, slightly sour flavor. The plant is native to the western U.S., and gets its common name from the California Gold Rush miners who ate it for vitamin C, to avoid getting scurvy. I’ve seen claytonia seed for sale in a number of seed catalogs. Try planting it this fall for a spring treat next year. Definitely a cool-weather plant, it will bolt in the slightest heat, so overwintering seems the best way to go. I didn’t give it any protection at all, but if you live in a particularly cold climate you could try it in a cold frame.